The aim of the school is to have pupils dress with a school identity in a smart, affordable and practical way, which conforms to standards of decency and safety and enables all pupils to be seen and therefore treated equally. The school uniform shows that pupils belong to our school community and should be worn with pride. 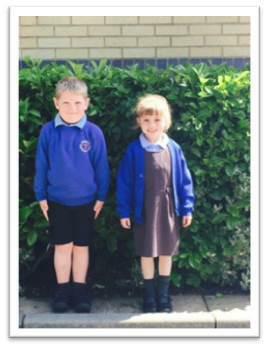 School Uniform is a requirement for being part of our school and is compulsory for all pupils. 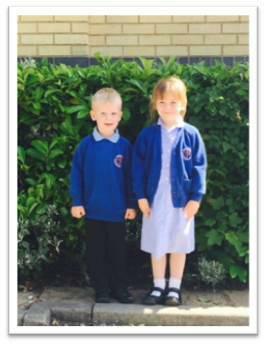 The school expects all parents who accept a place at Parson Cross C of E Primary School to comply with compulsory school uniform standards. All items of school uniform must be clearly named. Pale blue or royal blue polo shirt with school logo. Royal blue sweatshirt or sweat cardigan with school logo. Despatch bags or book bags with the school logo on are the only bags allowed in school. School polo shirts, sweat shirts, cardigans and school bags should all show the school logo and are available from school. Plain grey or black tailored school trousers. Trousers must fit at the waist, must not be hipsters, combats or jeans type and must be of normal school trouser material. Plain grey or black skirt or pinafore dress - no fashion items and not more than 5cm above the knee. Plain black, white, grey or navy blue socks or tights. Blue and white or yellow and white checked or striped school dress. Plain grey or black tailored school shorts – not more than 5cm above the knee. Plain black, flat school shoes. An appropriate coat whenever it is likely to be cold or wet. Asda, Primark, Matalan, Tesco and M&S all generally provide a range of school items which do not require the school logo and are in line with the school’s uniform policy. If you are unsure that the type purchased is correct for school please contact the school office. A plain t shirt in the colour of your child's school house. (Please contact school if you are unsure of your child's school house). We have PE Tshirts to buy in school with the school logo or you can purchase your own. No jewellery should be worn during any PE activity. One pair of plain, small stud earrings – must be removed for any PE activity. Wristwatch – must be removed for any PE activity. The school does not allow extremes of hair fashions i.e. no lines, patterns, shaved heads or obvious dying of the hair. Please check with school first if you are unsure. Mobile phones in school are discouraged. However school recognises that there may be some individual circumstances/occasions when parents may wish their child to bring a phone to school. In this situation parents should inform school of their request and on arrival at school the phone should be handed directly to the class teacher in a named bag/container for safe keeping. The parent/carer of any pupil with a genuine reason for not wearing an item of uniform must inform the school outlining the reason and agree a date when the pupil will be wearing the correct uniform. If no communication is received the pupil will be given pumps, polo shirt or sweat cardigan etc. to change into and parents will be contacted. If the issue is not resolved then the parent will be asked to meet with the Headteacher and a Governor. We recognise that it is the responsibility of the parents to ensure that their child(ren) is wearing correct uniform. However, where it becomes apparent that the child is refusing to comply with the uniform standards they will be given items to change into and given the opportunity to rectify the matter within an agreed time scale – normally 1 week. If the matter is not resolved then the pupil will lose their recreational time. However, where it is apparent that there is serious flagrant refusal to follow uniform policy then this will result in internal seclusion and ultimately exclusion. Periodic uniform checks will be carried out. If a child’s uniform does not meet the standards outlined in this policy parents/carers will be informed by a letter which will identify the reason(s) and there will then be a second check a few days later. We will always try to act in a reasonable manner and involve parents at an early stage. At the end of the year all children who have met the correct standards throughout the year will receive a certificate. In the interests of fairness and consistency across the school, please accept the Headteacher/Deputy Headteacher’s decision on all uniform matters.